You'll be able to select the option that works best for you after you borrow an ebook or on your Loans page (under ). 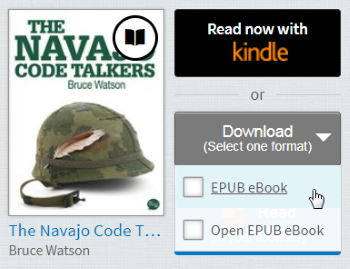 Note: In some cases, you may see a Download drop-down menu with multiple options (like EPUB and Open EPUB). You can choose one of these OR the Kindle option (U.S. only). Learn more about the differences between ebook formats or how to see the available formats for a title before you borrow. Go to your Checkouts page (under your Account). 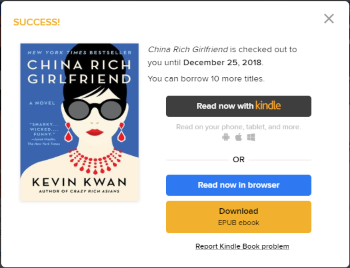 Select the Read now with Kindle button (U.S. only) OR the Download button. Not sure which ebook format is best for you? Learn about the differences between ebook formats here. If you're using your web browser, the Read (In your browser) option will always be available, even after you choose a download format. In some cases, you may see a Download drop-down menu with multiple options (like EPUB and Open EPUB). You can choose one of these options and select the "Confirm" link to download that format.